B&Q's website has hit rock bottom in Which? 's annual survey of online shops, with one user reporting how they suffered "a truly terrible experience". The consumer organisation asked more than 14,000 of its members their views about the ecommerce sites they had used in the previous six months. Overall scores for each online shop are based on customers' satisfaction with the store and their likelihood to recommend it to a friend. The survey also gives customer ratings for price, product stock, delivery, website usability and the returns process. Leading DIY retailers performed extremely badly in last year's report, with Homebase.co.uk coming 92nd out of the 96 websites surveyed, while B&Q came in second to last at number 95. But if B&Q thought it couldn't get any worse, it was wrong. This year, diy.com has slumped one final notch and now languishes at the very bottom of the table. Criticised for being a hard-to-navigate website, diy.com received a customer score of 55% in the survey, while lizearle.com - top of the online shops for a fourth year running - got 95%. One B&Q shopper told Which? : "I had a truly terrible experience with shopping online. The stock availability was incorrect and the whole customer service experience was rubbish." On the other hand, Toolstation was not only a new entrant this year, but went straight into the top 10, earning praise for its knowledgeable staff and good delivery policies. PCWorld's website had the distinction of being in bottom position last year but now that B&Q is there PCWorld has moved up one. Survey respondents said the main reasons for shopping online were because it is cheaper and easier to find what you're looking for. But the biggest irritation was being forced to pay for - or paying a lot for - postage and packing. Top delivery bugbears included items turning up damaged (9%), which was the main gripe, followed by deliveries not turning up (8%), inability to choose a delivery slot (7%) and delivery outside the agreed time (6%). Couriers came bottom of the pile when consumers' opinions and experiences of different delivery methods were compared. Regular post was the favoured way of receiving online shopping. Even staff struggle to place orders on is diabolical site we had a nice Site before kingfisher forced this one of us we have to navigate backwards and forwards to try to get things added to an order. It used to be easy And address, product number, delivery date, payment. What was wrong with that! 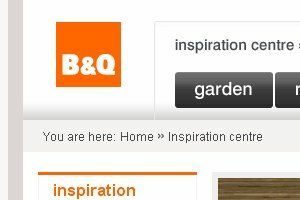 I agree that b&q have got it badly wrong on their new website.whoever programmed it should be sacked. For a start, the menu button does not work. Secondly, and most importantly there isno longer a search panel, where you can type a search for a specific item. The stylised blocks covering their general stock is just not good enough. I need to be able to specify what I want and not have to scroll through hundreds of items that I don't want. B&q need to put this right now, or why should I want to shop with them again?